Janice and Leroy are generally pretty quiet dogs. Which is a good thing, since I have some pretty snarky neighbors who have a) problems with big dogs to start with, b) little foo-foo dogs who of course would never annoy anyone with their incessant yapping, c) an over-inflated sense of their own importance, and – oh, never mind. I guess I was just about to turn this into a “big dog versus small dog” post, which was not really where I planned to go. Sorry. I’ll try to stop now and get back to the main point. Some dogs just love to bark. My friend Debbie’s beagle, Chuck, who I’ve talked about in Step Away From the Dish, Doggie, You are Way Too Fat, barks at cats, birds, kids, and just about anything that moves. Hounds are kind of like that, I suppose. Al, the owner of the elderly Saint Bernard, Hannah, tells me that he can’t even remember the last time Hannah barked. Neila informs me that her four Rottweilers bark when a leaf falls. I know that people will often tell you that the way a dog behaves has “everything to do with the owner and nothing to do with the dog,” but I don’t think that’s true. Sure, a lot of dog behavior is nurture, but a lot of it is nature as well. Think about it – beagles like Chuck are known for running and being unwilling to come back when called. Labrador Retrievers are known for their love of water. English Mastiffs are typically lazy and often have to be practically forced to exercise. Toy poodles are known to be high-strung. Sometimes, it’s just something in the breed that informs the behavior. So, what can you do if you have a naturally barky dog? I’ve talked about this in Apartment Dwelling Dogs, and also in What is My Dog Trying to Say?but I’ve only discussed the issue in reference to individual dogs. When you have more than one dog in your household, then barking can be even more problematic. Dog Number One decides that it would be a good idea to bark, and then Dog Number Two picks up on the notion, and if you have more than two dogs, next thing you know you have a virtual cacophony of dogs, all barking and wailing at different levels and pitches, and if you’re lucky they’ll shut up eventually. If you’re not lucky, then my your horrible neighbors will take you off their Christmas card list, not invite you to their next barbecue, tell the other neighbors how horrible you and your dogs are, and maybe even bring the law down on you. And then you’ll have to either find a way to make up to them for the whole mess, or take measures that will ensure they have to move. What can you do when you have more than one barking dog? You’re going to have to teach them how to behave. Now, the thing is, any time that you have more than one dog in your household, there is always going to be one whose behavior affects the behavior of the others. In my home, Leroy usually follows Janice’s lead, and that’s fine, because neither of them have problematic behaviors. If Leroy wants to play when Janice wants to play, or if he wants to sleep when she decides it’s nap time, or if he decides it’s not dinner time unless Janice has already eaten, there’s no biggie there, right?These are perfectly fine, acceptable behaviors, and they don’t cause anyone any aggravation. But what if you have a barky dog, and your normally quiet dog decides that if Mr. Barky McBarkus perceives a reason to get loud and annoying, then it’s time to go nuts? In terms of behavior, it’s not dangerous, but it can be beyond annoying for anyone who has to listen to it. Here’s the thing – any time you have more than one dog, unless you have two of a naturally quiet breed, you can probably assume that there will be one who will bark more loudly and more persistently than the rest of the gang. 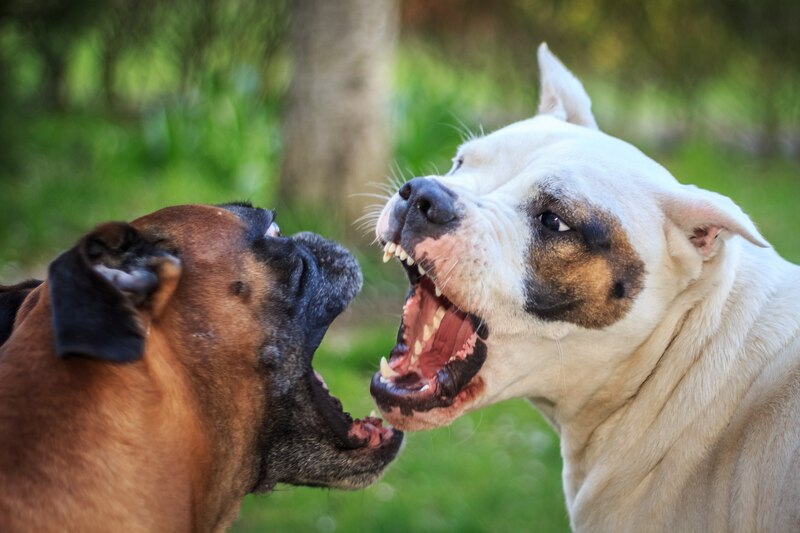 As a responsible dog owner, you are going to have to modify the behavior of the barking dogs, and it’s not going to be easy if you have more than one culprit. Okay, we’ve talked about positive reinforcement many times – the idea of rewarding good behavior while ignoring the bad. So, if you have one barking dog, for instance, you tell him “Quiet.” And when he stops barking, you give him a treat. But if you have more than one barking dog, and one stops while the other continues yammering away, what do you do? How can you reward the quiet dog without also giving something to the barking dog, thereby telling him, in essence, that he’s doing a good job? This is where you have to switch it up a bit. Hold the treats in your hand, but don’t give them. Say “Quiet,” and when both are quiet, both get treats. If one dog continues to bark, then make a show of putting both treats out of reach. Say “Quiet” again, and when both dogs are quiet, give them treats together. It’s sort of a combination of negative and positive reinforcement – barking on the part of any dog results in the treats being taken away. Quiet on the part of all dogs means that everyone gets a treat. What you need to keep in mind here is that you are only trying to change the behavior of one dog. The barky guy. And if you find that working with all your dogs together isn’t giving you the result you need, you can try confining the others while working with the problem dog. Once he stops barking when you ask him to, he probably won’t set the others off. So you can try working with a group to begin with, but if it doesn’t seem to be producing the right result, take them out of the group one at a time, and work individually with the main instigator until the barking stops. Then gradually re-introduce the other dogs, working with two at a time, then three at a time, or however many dogs you have one by one. When each dog, individually, can handle the situation without barking, then you’ll be able to work with them together. The problem with training a lot of dogs at once is that much of the time, owners don’t want to work individually with their dogs. “They love being together,” the owner says, and yes, they do. But when you’re dealing with barking issues, you can end up with a cascade effect. One dog barks, then another, and then another. And next thing you know, you have every single dog in the house barking like crazy. This is why you work one-on-one, and then move to pairs, and then add in other dogs as training progresses. Almost always, you will need to start with the one dog who seems to be setting everyone else off. Now, what this means is that you might even have to walk all your dogs individually. I know, it’s so much easier to just take all five of your dogs, and snap on the leashes, and go walkies. But you’ve got Barky Smurf there, and when he sees a squirrel, he’s going to go bugshit crazy. Then, the rest of your gang are going to want to get in on the action, and they’re going to react to other stimuli – passing cars, pedestrians, someone flying a kite in the park – you name it. So you will, whether you like it or not, have to walk individually if you have a problem barker, or at the very least recruit other people to help you walk your dogs. Now that you have your dog-walking friends in place, you need to work on counter-conditioning. You will do this, and so will your partners in this worthwhile endeavor. Here’s what you do. When your dog sees something that would ordinarily induce him to bark – a car, a squirrel, another dog, a pedestrian, or whatever – give him a treat before he starts to bark. Then, let him get a good look at the distraction, and again, give him a treat before he barks. Rinse and repeat. In other words, keep on doing this until he is able to pass by the distraction without barking. He doesn’t have to get a treat every single time after the first few attempts. He just has to know that if he passes by the distraction without barking, he might get a treat. Ultimately, he’ll get the idea that something good might happen if he doesn’t bark, so he won’t bark. He won’t want to take the chance that he could be foregoing something good if he behaves in a way that displeases you. Eventually, your dog will get the idea that if a squirrel, car or whatever comes on the scene, you might give him something, and he will be far less interested in barking than he will in getting his reward. It really doesn’t matter what the stimulus is – it could be just about anything. Basically, your dog gets the idea that stimulus equals treat. Gradually, you will be able to reduce the amount of treats that you offer, and eventually he will pass by whatever stimulus without needing a reward. Well, yes, of course this sounds easy. But it’s very hard to do with two dogs at once. This is because timing is so important – you have to give the treat the minute your dog sees the distraction, and before he starts barking. The chances of you managing two barky dogs at the same time, and getting the timing right, are slim to none. That’s why you need a partner, or several partners if you have several dogs. Once each and every one of you has managed the counter-conditioning, then you will be ready to walk all of your dogs at the same time. Okay, this sounds pretty good when you’re walking dogs outside, but what happens when the bark response occurs in the home? You know how this goes – everyone is calm and quiet until the doorbell rings or someone knocks on the door, and then all hell breaks loose. Even if it’s just one dog that’s prone to bark, everyone else jumps in. This is what’s known as “arousal behavior,” and it can happen no matter how good your attempts at counter-conditioning. The behavior of one dog causes escalation in the behavior of the others. So, I touched on this a bit earlier, but to be more specific, you basically take the same approach as you do outdoors – work with one dog at a time. You can recruit your friends for help with this as well. Use the same counter-conditioning techniques, using treats. And keep in mind that if one dog goes off, they probably all will. So, keep your dogs and your friends in separate rooms, and work one on one, and then two together, gradually adding dogs to the mix. Watch for any signs of escalation, and if it looks like things are about to go south, pull back and try again later. If things do look to be going other than as planned, a good interruption can work wonders. Is there a phrase that your dogs automatically respond to? It could be a loud and firm “Come here,” “Settle down,” or even “Dammit, guys!” As a matter of fact, when Leroy was a puppy, I’m sure he thought his name was “Leroydammit,” I used that phrase so often! Of course sometimes words alone will not suffice. Can you do one of those whistles where you stick both your fingers in your mouth and just let loose? Sometimes that works. Or, you could buy a storm whistle – many dog people I know just love them, because they’re so loud and great for immediately getting attention. You can even stash them in various places around your yard and house so that you’ll always have one available when your dogs get out of hand. Of course if you’re going to go with this approach, you’re going to want to work with your dogs in such a way that they associate the whistle with something good – it should always be used as a positive reinforcement tool, never as a punishment. Neila used one with a couple of headstrong Rottweilers, and now when they hear the whistle, they know that they’re going to get treats, provided that they stop whatever bad behavior they’re engaging in (that barking when a leaf falls, for instance) and rush over to her. Now, with whistle training, you are still going to have to work one dog at a time. So keep one close to you, blow the whistle, and offer a treat. Do it again. And again. Do it more times. Finally, your dog is going to get the idea that as soon as he hears the whistle, a treat will be forthcoming. Once you’ve got it nailed down at close range, try it at a distance. As soon as Dog Number One is whistle-trained, work on Dog Number Two, individually. Then try working with them together. Keep on adding dogs to the exercise, until you are confident that every single one of your dogs will stop whatever they’re doing (barking included) and head straight for you as soon as they hear the whistle. Set yourself up for a situation where your dogs are likely to bark. Recruit friends to walk by, run by, drive by in their cars, and so on. Anything that will trigger a bark response. See how well your whistle training and other methods have worked. If no one barks, you’ve got the job done, so reward your dogs. Then reward yourself – you probably deserve a nice glass of wine, a trip to the mall, or maybe a relaxing night with Netflix and some chocolate. You’ve done some hard work, and accomplished something pretty significant. You are a good person, and you have trained some pretty good (quiet) dogs.